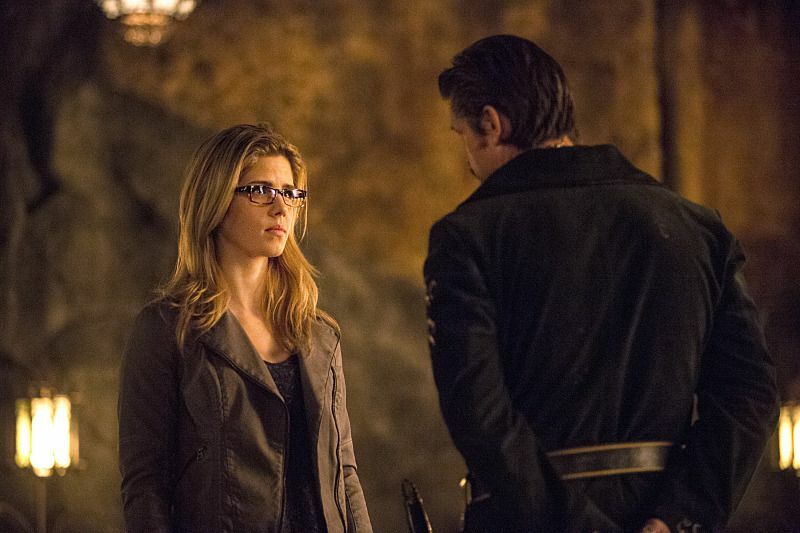 With Thea near death, Ra's Al Ghul has finally made an offer Oliver Queen can't refuse. For Nanda Parbat houses The Lazarus Pit - a magical pool that can heal those near death. Oliver will gladly sacrifice himself to save his sister's life, but will his allies - particularly Felicity - allow him to make that choice? Five years earlier, Oliver, Maseo and Tatsu race to stop the release of the Alpha/Omega bio-weapon on Hong Kong. Son of the Demon. Indiana Jones and The Temple of Doom (the ritual involving the Lazarus Pit and the scary fortress - as Felicity calls it - having a secret passageway out through the catacombs). Various stories involving The League of Assassins by Dennis O'Neil. Ollie and Felicity's night together is reminiscent of the night shared between Oliver Queen and Marianne in Green Arrow #76. Thea's leap from The Lazarus Pit involves some rather obvious - and clumsy - wire work. Apart from giving Katie Cassidy an excuse to appear in this episode, there seems little reason for Felicity to unburden herself on Laurel Lance of all people. To quote the woman herself, "Are we friends now?" Cassidy's wooden reaction to Emily Bett Rickard's breakdown doesn't help how unnatural the scene feels. Stephen Amell does some great wordless acting during Thea's surgery and in the scene immediately after the title cut. It's the first time we've seen Ollie so shaken and he conveys it well without saying a word. John Barrowman is famed for his campy performances but his reaction to Thea's injuries as Malcolm show that he can play it subtle when needed. Emily Bett Rickards dominates this episode as Felicity shows a new fire in her efforts to save Oliver as he's saved her so many times before. As before, Matt Nable plays Ra's Al Ghul perfectly, with just the right sense of menace and sympathy. You really believe he regrets the actions he's taken to push Oliver to this point, even before he tells his own tale of how he came to join The League of Assassins. The chase scene in the flashback as Ollie and the Yamashiros go after a military vehicle is a thing of beauty. In the comics, The Lazarus Pits are naturally occurring pools of an unspecified chemical mixture. The Lazarus Pits are capable of restoring the near-dead to life and Ra's Al Ghul has used the pits to extend his life for several hundred years. The effects of The Pits are temporary, however, and they lose effectiveness over time. In the comics, The Lazarus Pits cause temporary insanity in the person resurrected by them. They also give them a measure of super-human strength while they are possessed by the madness. On the show, this seems to be true of Thea as she leaves The Pit. On one occasion, a dying Joker was placed in a Lazarus Pit and it temporarily restored his sanity. On another occasion, Black Canary was placed in a Lazarus Pit and it healed the damage to her vocal cords that prevented her from using her Canary Cry. In the comics, each Lazarus Pit can only be used once. However, Ra's daughter Nyssa discovered a way to make The Pits last forever though these pits had more unpredictable effects. For instance, one of Nyssa's pits changed Mr. Freeze's wife Nora into an insane lava monster. There is some suggestion The Pits may cause permanent insanity with extended use, though it is possible Ra's Al Ghul was mentally unstable before his discovery of The Pits. In keeping with the DCTVU version of Nanda Parbat, The Lazarus Pit here is a special healing spring ala The Fountain of Youth. Malcolm Merlyn claims Ra's has used the waters of Nanda Parbat to live for over 100 years and that in rare instances those waters can be used to raise the dead. He further claims the waters change a person's soul and that the person who comes back will not be the same as the one that died. The Pit leaves the resurrected Thea with a wildly erratic form of amnesia. She recognizes Malcolm Merlyn as her father and calls him Dad, apparently not remembering her reasons for hating him. She doesn't recognize Oliver but does believe her brother Ollie to be dead. She doesn't remember that her mother Moira is dead and seems to believe that she and Merlyn are on good terms. She seems to be fully recovered by the time she returns to Starling City. At the very least, she's back to hating Merlyn. Ra's story to Felicity about his past suggests that the League of Assassins was founded long before he joined it. In the comics, Ra's founded the organization. Oliver: I'd prefer that we didn't do our usual 'Please don't go' dance. Felicity: We're not going to. Because I'm coming with you. Felicity: I need a favor. A really big favor. Ray: The last time you asked me for a big favor I had to loan you my helicopter. Felicity: Don't need your helicopter. I need your jet. Diggle: (scoffing) League of Assassins. You're feared for your bravery. And power. But all I see are a bunch of weak men running from their lives. Trying to escape. That's not powerful Maseo. Or brave. It's cowardly. Maseo: Do not presume to know me until you've held your dying child in your arms. Until you've told him everything would be okay. So that the last words he'd ever hears are a lie. You know nothing! Diggle: I'm sorry. What was your child's name? Diggle: Do you think Akio would be proud of his father right now? Ra's Al Ghul: You have a great fire within you. I can see now why Oliver loves you. Felicity: If you knew the first thing about love you would not be ripping Oliver away from his family. Ra's Al Ghul: I am merely helping him fulfill his destiny. Felicity: Yeah. I know all about the "Survive My Sword" prophecy. And I am here to tell you that I could really give a crap. Me and John and - God help me - Malcolm are not going to let this happen. And we have resources. And we will go to war to get Oliver back. Felicity: Sounds like you gave up too easily. Ra's Al Ghul: There is one immutable truth about life - it is often more cruel than it is fair. And it rarely provides an opportunity for any of us to find closure. And all your posturing and all of your threats of war... they merely delay the inevitable, causing you to forfeit the opportunity you have which was denied me. You need to tell Oliver goodbye. Tell him how much you love him.Tell him whatever it is your heart needs to express. And do it now. Before he is lost to you forever. Oliver: Hold! I am Al Sah-Him! Wahreeth Al Ghul! Heir To The Demon! And you will obey! Diggle: Oliver... Oliver, I don't know what to say. Oliver: I do. John, you're the best man I've ever known. Whatever happens, you're my brother. Ra's Al Ghul: The word "assassins" has fallen victim to many abuses of language. It's real meaning hidden beneath the sediment of lies and falsehoods. In truth, Assassin comes from Hashishiyya, which means "Those who stand apart from society". Now, every man and woman in here have renounced their past life and forfeited their identity in the name of something new. And it is a cleansing only achieved by fire. The address of Thea and Ollie's apartment is 455 Merced, Unit 10. The League of Assassins use smoke signals to communicate. Ray Palmer owns a private jet as well as a helicopter. Ray refers to the events of 319 and Roy's farewell to Felicity. Malcolm Merlyn suggests consulting with STAR Labs to see if they might be able to help Thea. Ollie tells Felicity about the events of the flashback scenes in 314 and how he briefly returned to Starling City and killed Thea's drug dealer. Ollie's name in the League of Assassins is Al Sah-Him - The Arrow. Felicity drugs Oliver using the same powder used on Thea following the resurrection ceremony. Oliver takes on the title Wahreeth Al Ghul - Heir To The Demon. Maseo/Sarab confesses to aiding in Oliver's attempted escape. Ra's forgives him, for the actions were those of Maseo - not Sarab. Oliver is branded with an arrow-shaped brand below his right shoulder. In the flashback, the vial containing the virus breaks during Ollie's struggle with the soldier holding it. Thea is reduced to being a damsel in distress for the entirety of this episode And the soul-changing effects of the Lazarus Pit doesn't seem to have changed her much at all. An episode that is far more than the sum of its parts, though some of the individual parts are unforgivably weak. For all of Merlyn's warnings about The Lazarus Pit changing people, Thea seems fine by episode's end after spending the entire episode in such an inert state she could be replaced with a house plant and nobody would notice. That said, Emily Bett Rickards and Stephen Amell knock it out of the park with this episode and David Ramsey and John Barrowman do surprisingly well with the little they have. This episode wasn't much for big reveals but it has set the stage for the end of the season and the final battle.